Meditative music plays softly in a candlelit room. The women seated at tables and on couches have closed their eyes; their heads are bowed toward folded hands. In preparation for the morning’s meeting, one woman prays as the others nod in subtle agreement. This small group has been gathering for several months. As the prayer concludes, they cross themselves in the name of the Father, and of the Son, and of the Holy Spirit, Amen. Then they each reach for an ear-marked book and open to the chapter meant for the week’s discussion. With more than a billion members, the Catholic Church is the largest Christian church in the world. In order to modernize the Catholic experience and inspire growth in its members, more and more small groups of Catholics are gathering around books. Led by a consistent procession of new Catholic studies and books, the small groups represent the changing landscape of Catholicism. George Weigel, distinguished senior fellow of the Ethics and Public Policy Center, is a Catholic theologian and one of America’s leading public intellectuals. He is also a prolific writer contributing a number of Catholic books to the growing pile. He explains that, beginning when Vatican II convened in 1962, the Catholic Church entered into a modern era of Evangelical Catholicism. In a lecture presented at the University of Rochester, 21st Century Catholics in an Unfamiliar America, Weigel explains that Catholics are being called to engage modernity. “We need to meet cultural changes with distinctively Catholic tools,” he says. The sentiment to engage purposefully with both Biblical and Catholic materials is becoming more popularized. With the interest has come the introduction of a variety of books, programs, and journals. As part of the momentum for the Catholic Church’s new evangelization, Catholic women have been swept up in the conversation and are adding their voices quite significantly in the small groups where they gather. “As Catholics, we grow and learn in community,” Wahlquist says. Women especially crave the nourishment found by sharing their growth with one another. Books shared in a small group setting provide an accessible and intimate community for the participants. The small-group approach makes it possible to individualize programs to meet the needs of individual parishes. The point of educating today’s Catholics is to give them more confidence in their faith so they can more comfortably share that faith with others. It doesn’t look the same from parish to parish or from group to group. Cradle Catholics as well as the newly-converted faithful are finding value in the small group approach to learn more about Catholicism and the New Evangelization. CJ Hohn asks the women in her small group to form a circle around a candle. 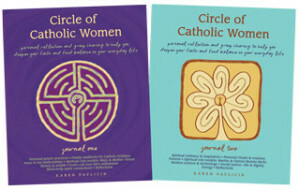 They begin in prayer before discussing this week’s journaling topic from Circle of Catholic Women–Journal Two. For the women of St. Ambrose of Woodbury Catholic Community in Woodbury, Minnesota, it was a journaling series called Circle of Catholic Women: Personal Reflection and Group Sharing to Help You Deepen Your Faith and Find Balance in Your Everyday Life that helped them to grow spiritually, intellectually, and emotionally. Yvonne Eggert, who was raised a Lutheran, enjoyed the Circle of Catholic Women series because the small-group conversations provided a nurturing place to ask deep questions. 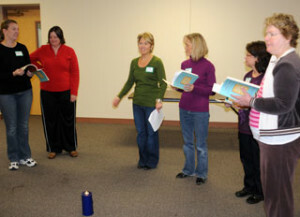 Circle participants credit the fellowship of the women and the “aha” moments for making the experience so valuable. The journals–and the small group discussions– provide emotional and spiritual growth, and at every session, allow God to speak to each person through the other women in the group. Wahlquist argues that it is imperative for Catholics to do more than just read the books they share in their small groups. She explains that the New Evangelization depends upon Catholics not only reading together and sharing together, but also sharing what they learn with others. No matter how a parish brings in books, programs, and journals to enhance the growth of parishioners, Wahlquist hopes Catholics are inspired to take the first step in the growth of their faith. Meagan Frank is senior writer for Books Make a Difference. 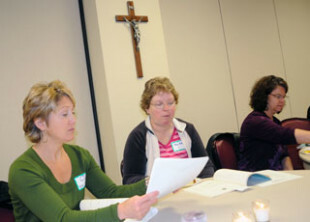 She has participated in women’s spiritual small group discussions. Connect with Meagan on the web, Facebook, Twitter, or email.